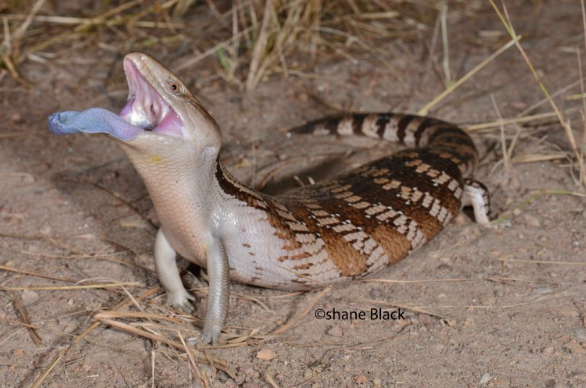 A new study by researchers at Macquarie University has shed light on why blue tongue lizards have such an outrageously coloured tongue, given that the vast majority of lizards have a regular pink tongue. The study, just published in the journal Behavioral Ecology and Sociobiology, found that the colour is not accidental, and likely evolved as a protection against predators. “Not only are their tongues blue, but they also have a very pure UV component, and the purest or most obvious UV was also at the rear of the tongue. UV is not visible to most mammals (and therefore humans), but is visible to lizards, birds and snakes. Given that both male and female blue tongues have UV tongues, we tested the hypothesis that the tongue colour probably evolved in response to predation pressure,” said study author Associate Professor Martin Whiting from the Department of Biological Sciences. Some animals use a highly conspicuous display in an attempt to overwhelm the sensory system of a potential predator. This acts as a form of sensory overload that causes a predator to pause or even abandon its attack. “Blue tongue lizards have a highly conspicuous tongue, but unlike many other kinds of lizards, it’s a big tongue—the surface area is large. When blue tongues do a ‘full tongue’ display, the mouth is opened widely and the tongue is flattened and expanded. At the same time, they may hiss and puff-up their body for maximum effect. This behaviour, in combination with a highly conspicuous tongue, can be quite intimidating for anyone that has got too close to a wild bluey,” said Associate Professor Whiting. The researchers, Associate Professor Whiting, Pau Carazo, a postdoctoral researcher at Macquarie (now at the University of Valencia) and Sam Price-Rees, placed blue tongues in a large-outdoor enclosure, where they held them briefly in order to test their behavioural responses to model, or fake, predators. The lizards were presented with a model snake, bird, fox, goanna (a large predatory monitor lizard), and a control element (a piece of wood) in order to establish if they use their full-tongue display as a means to intimidate or overwhelm the sensory system of a predator. “Blueys did not respond much to the piece of wood (control) while they showed a strong response to the model predators that would normally represent the greatest threat. By delaying their display until the predator was very close, and exposing the rear of the tongue, which has the most UV and which is the brightest, blueys maximise their chance of intimidating a predator and surviving another day,” concluded Arnaud Badiane, a PhD student on the research team. Future research will involve building a robotic bluey with interchangeable tongues of different colours and then to present it to predators to confirm the anti-predator hypothesis. Associate Professor Whiting’s lab has done exactly that, and is in the process of testing the response of predators to UV-tongues and pink tongues.